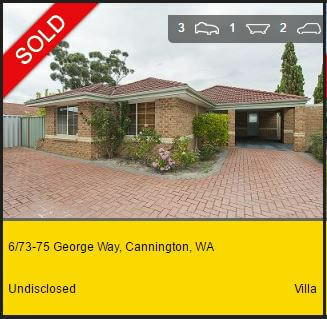 Thinking of selling your home in Cannington. Why not get a free property appraisal to determine the value of your house, block of land or unit. We arrive at the price of your home with a number of factors. They are, location to schools, shops, amenities and public transport to name a few. We also check the recent sales history of real estate in the area. If you decide to sell your home we marry the property details with our database of buyers and investors to see if there is a match. You may wish to sell your property privately, at a fixed price or via an auction. We will walk you through all the processes and show you how we market a home for sale. How much is my home worth in Cannington? The median price for a house as of March 20, 2017 is $424,000. The median unit price is $392,000. Over the past 12 months there were 72 homes sold and 31 apartments sold. The Data to Supply Ratio DSR rates homes in Cannington as below average and units as balanced. For houses this means that supply is ahead of demand. Home buyers can be choosy and sellers need to be patient to get their asking price. A balanced rating indicates that the are equal buyers and sellers. Capital growth for units should grow with the national average. House prices and rent returns in Cannington. Unit prices and rent returns in Cannington. Do you have an investment property you wish yo rent? Our free rental appraisals will determine your expected rent return. We have leased over 1000 properties in the area. We manage tenant placement and all landlord accounting. We have strict guidelines with tenants that we expect to be honoured in good faith. We treat tenants and landlords equally. We vet all potential occupiers to make sure we find the right fit for your rental. When it comes to rent collection we have a zero tolerance rent arrears policy. When the property is rented out we hold a collection of photographs and carry our routine inspections. Cannington is located just 11 kilometres south of Perth. Its neighbouring suburbs are Ferndale, Beckenham, Queens Park and Bentley. Along the eastern border you will find the Beckenham, Cannington and Queens Park railway stations. Along the eastern border is the Canning River. A Westfield shopping complex houses Hoyts Cinema, Kmart, Bounce to name a few. You will also find an Office Works and Bunnings in Cannington. The Canning River Regional Park has multiple walking tracks that runs about 6 kilometres alongside the Canning River. There is the Cannington Community College that has students from kindergarten to Year 10. In the 2011 national census there were 5277 recorded residents. Forty percent are registered married and 8% are in a defacto relationship. The work force are a mixture of professionals, managers, trades people, labourers and clerical workers.